Thomas was on the field for all but 10 plays in his first game following his holdout. 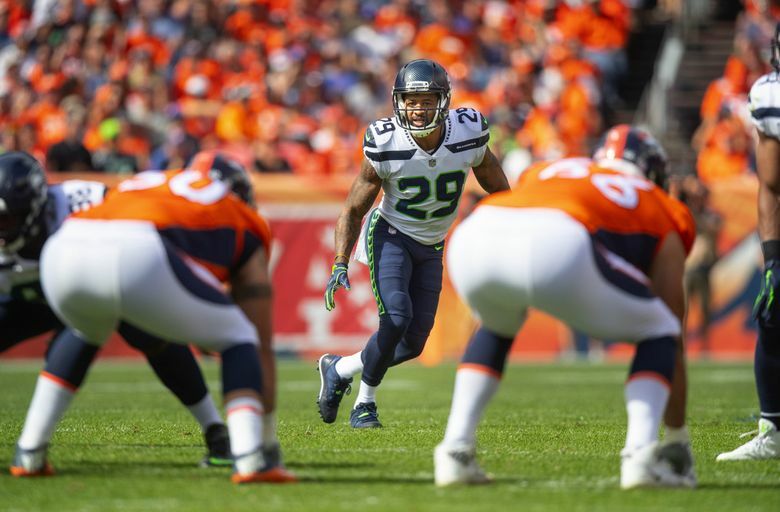 DENVER — As long as Earl Thomas could play, there was never really a doubt that he would play Sunday in his first game back after ending his holdout on Wednesday. But coach Pete Carroll said that with just three practices and a day-before walk-through under his belt, Thomas was also going to be monitored. “We couldn’t play him the whole time,’’ Carroll said. Ultimately, Thomas played all but 10 snaps – an entire 75-yard, seven-play scoring drive by Denver in the first quarter and then the first three plays of what turned into another scoring drive by the Broncos in the fourth quarter. After Denver gained 44 yards on the three plays of the fourth quarter drive, Thomas hustled back onto the field. Told later how much Thomas had played, Carroll said it was more than he probably should have. “We were just trying to gauge it as we went and we were trying to not overload him and not get him too many plays at any one time,’’ Carroll said. “The guys just switched him in and out based on kind of what happened and it was not like numbers of plays as much as it was just how much he had to endure when he was on the field and how he was bouncing back. So, we just had to take care of him you know. Thomas said he felt good after the game. Seattle also had had Kam Chancellor on a similar pitch count when he ended his holdout in 2015, playing 37 of 47 snaps in a game against the Bears. The Seahawks appeared for a moment to take a 14-7 lead in the second quarter on a 7-yard pass from Russell Wilson to Brandon Marshall. But the play was nullified due to an offensive pass interference penalty on Marshall for pushing off on Denver corner Adam “Pacman’’ Jones. And while Seattle fans later questioned the call, Marshall said he couldn’t. Marshall said he thinks he’s been called for OPI “probably four times’’ in a career that dates to 2006. The Seahawks thought they had forced a turnover on Denver’s third drive when Royce Freeman fumbled and Seattle appeared to have the recovery. But the officials ruled Freeman was down by contact and Denver – going no-huddle — got the next play off before Carroll could get the challenge flag out to have the play reviewed. Carroll said he should have gotten the flag out more quickly but also said he wasn’t sure what had happened on the play since he didn’t see the fumble. “They went fast, they were going fast and I had a couple of seconds to throw it and I’ve got to find an official,’’ Carroll said. “It kind of set me back for a moment and I just delayed and they were going so fast that they got it off. I threw it, but he said it was too late to call it, which I’m sure he was right about that. I just needed to respond a little bit faster. I didn’t hear the word from upstairs as quickly as I needed to get it executed before they hurried up. Wilson was sacked six times, which will undoubtedly draw lots of criticism of an oft-criticized Seattle line from those who just see the numbers. But quarterbacks can also be to blame for not getting the rid of the ball as quickly as they should — or getting rid of it at all. And Wilson later took the blame for three of the sacks, though he also noted that on two — which each came on third down in the fourth quarter — he was trying to keep the play alive, something he has done well in the past. “I think a couple of those were on me,’’ Wilson began, before elaborating. “Granted, third down, I am trying to make a play. If it’s not there, I am not trying to just give up on the play. I would definitely say probably three of those are on me just trying to make a play and it’s not there. It’s a part of the game. I lot of great things have happened when I’ve scrambled. A lot of good things have happened like the (20-yard) touchdown to Brandon (Marshall in the third quarter). It was third down. It wasn’t there. I moved a little bit then boom – touchdown. The sacks resulted in some significant lost yardage — 56 yards overall including 22 on the last play of the first half when Seattle had driven to the Denver 41, and 13 on another in the fourth quarter. The Seahawks’ defense failed to force a turnover in four preseason games. On Saturday, the dam finally broke. It didn’t mean everything on Sunday, though, as Denver managed to pile up 470 total yards and 329 passing yards in a 27-24 victory. McDougald said the Broncos’ offensive success had more to do with the Seahawks. “It’s really us. It’s us. It’s us,” McDougald insisted. “Guys have to make better reads or make better schemes or communicate better. They did a good job of going hurry-up tempo or no-huddle, and guys have to communicate better.